There are mainly two common types of hays, legumes and grass hays. Timothy hay is an example of grass hay and Alfalfa is legume hay. As a crop they are often grown together. Both crops can vary tremendously in quality, especially grass hays, depending, on type, what location it's grown, and at what particular stage it's harvested. Timothy hay is a commonly grown hay because of its suitability and tolerance to cooler weather and it's growing adaptability in a variety of different soils. It is also the least susceptible to mould in storage as it has very little moisture content when correctly cured and stored. It looks very parched when compared to other grass hays. It's average protein and calcium content at harvest is 9 to 9 1/2 % and 0.3 % calcium (dry weight) but can drop significantly if harvested late. Late crops, or crops grown in too warm a climate develop coarse stems by increasing lignin in the plants structures, this often makes it very unpalatable for a lot of livestock. 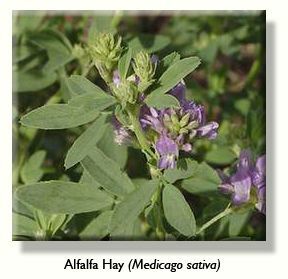 Alfalfa is one of the world's oldest crop plants and use pre-dates recorded history. Sometimes you may hear it being called Lucerne. It is a leguminous plant, and legumes are herbaceous plants, being very nutritious and high quality fodder. Like other crop plants it's harvested at various stages of growth but early bloom crops have optimum nutrient values. Like all crops it's nutritional content can vary tremendously, its protein content can vary from 13% to 22% and calcium content varies from 1 to 2%. Its fibre content can range from 23 to 38%, all values depending on plant type, location, weather, time of harvest and subsequent storage. Nutritionally it contains every essential amino acid. It also contains enzymes that are important for food digestion. It also contains a very wide range of vitamins, minerals and trace elements. As part of rodents diets both products are excellent supplements and can be mixed in small quantities with their regular feed. (As a rule of thumb i tend to feed fresh greenstuffs and insect based food only during spring, summer and autumn and omit the practice in winter months as naturally these foodstuffs are not available then) small rodents and Gerbils in particular can benefit from the higher protein and calcium in alfalfa, also the calcium content can help maintain bone density which is quickly lost with age in older rodents. In the U.K. there are several other grasses that are commonly used for haymaking. Apart from Timothy, other grasses are rygrass, fescues, meadow grass and Cocksfoot (orchard grass) . Fibre content in these species is high and range from 29.8% for meadow grass up to 35.6% for Orchard grass. As far as meadow hays go the nutrient values will vary greatly depending on what time of the season it is cut. Cutting before flowering always yields the highest nutrient contents. Also the age of the hay can affect nutrients, and prolonged storage can lead to losses especially in vitamins such as A,D and E. The protein content of these grasses are highly variable and can be as low as 6% and as high as 17%. As a rule of thumb for nutritional quality, the longer the hay is left before it is cut the higher the fibre content will be, this is at the expense of protein, minerals, trace elements, and also energy values. Hay growing in the field during the months of June or July will be leafier, rich in nutrients and high in protein, however by the time it is August the protein value may have dropped to half of what it was in July. Visually, the greener the hay, the more chlorophyll it contains and it will also higher in vitamins and minerals. The browner hays are older, higher in fibre and have less nutritional value, although it will be higher in vitamin D through exposure to the sun. Good hays are easy to discriminate from bad hay. It is sweet and fresh smelling, feels good and clean and is dust free. Straw is produced as a by-product of the grain industry. Straw has less nutritional value and is higher in fibre as it's grown longer and harvested after it has set seed which increases fibre but at the expense of it's nutritional value. As most grass/crop type plants are annuals i.e. they die after setting seed, so all the nutrients are transferred from the stems and leaves into the seed. Another point is that straw and hay can come off the same plant e.g., oat straw and oat hay; the difference is how long the plant has been allowed to grow before cropping. The best hays are cut just before it flowers, and the younger it's cropped the higher the protein and nutrient value.